The authors describe a complex case of a young patient in need of revision total hip after a primary total hip for SCFE. The rate of conversion to arthroplasty is estimated to be at least 45% at 50 years after a slip . One study found a mean time from slip to arthroplasty of 7.4 years in SCFE patients with osteonecrosis or chondrolysis, compared with 23.6 years in SCFE patients with degenerative changes . In SCFE, the anterosuperior head-neck offset is decreased, which may require removal of impinging bone or relative anterior and superior placement of the femoral component to avoid impingement. 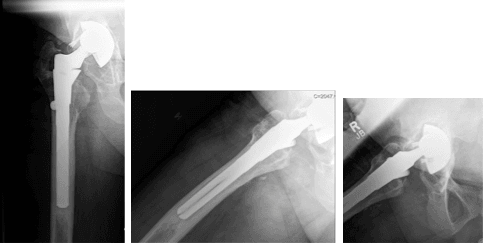 Other considerations include possible staged hardware removal prior to THA, dissection through scar tissue, and possible poor bone quality secondary to osteonecrosis compromising fixation . Successful THA generally results in restored quality of life . Hip revisions are an increasingly common operation,  and the rate of revision may be increased in THA done for SCFE. One study found that the probability of loosening 15 years after THA for SCFE was 60% on the acetabular side and 20% on the femoral side . Another study, however, found that after adjustment for differences in age, gender, and type of prosthesis, there was no difference in risk of revision found for primary THA performed due to pediatric hip diseases versus those performed due to primary osteoarthritis . When all total hip revisions are studied, positive predictors for survival are age greater than 70 years, revision for aseptic loosening, and either revision of both components or just the acetabular component . A study of THA in patients age 55 and younger found a 99% survival rate of primary THA, but only a 69% survival rate of revision total hips at mean follow-up of 6.7 years . From these studies, we believe that primary THA after SCFE is a challenging but rewarding operation. However, components placed in a young patient may have an increased risk of loosening during the patient’s lifetime, likely due to many factors including activity level and patient age. Thus, total hip revisions are common in this patient population. A 42-year-old male patient with a past medical history of SCFE and subsequent THA at the age of 27 was referred to our service for revision THA. He complained of daily worsening groin and thigh pain over the past year. Figure 1. Preoperative images demonstrating a loose acetabular component with superior migration. Femoral stem appears well fixed. The patient had a negative workup for infection (normal erythrocyte sedimentation rate [ESR], normal C-reaction protein [CRP], normal synovial fluid aspirate) and underwent revision THA of the right hip. In the operating room, under spinal anesthetic, the patient appeared about 1.5 cm shorter on the right lower extremity. Using the prior lateral incision, a direct lateral approach was used to gain access to the hip. During exposure, it was noted that the patient had wasting of all muscle groups supplied by the superior gluteal nerve – gluteus medius, gluteus minimus, and tensor fascia lata – and a moderate amount of gray fluid. The acetabular component was grossly loose with an extensive amount of wear-induced reaction. The soft tissues were debrided extensively and all nonviable tissues were removed. The femoral head was removed, and the femoral component was exposed and noted to be well fixed. The acetabular component was removed without difficulty, and extensive debridement of the acetabular socket was performed. The defect appeared nearly spherical, and an augment was not used. Sequential acetabular reaming was performed, and the acetabular component (size 64) was impacted into place. Solid fixation was achieved and augmented with multiple screws. The liner was inserted into the shell and the hip was reduced with multiple trial heads until it was found to be stable throughout and limb lengths were equal. The final femoral head was a 36+12. Three samples were taken at the time of surgery and sent for culture. All were negative at 14 days following the procedure. At the 6-month follow-up, the patient is doing well. He is not using a cane and has equal leg lengths, although when walking longer distances, he feels discomfort and pain over the abductor musculature. Images demonstrate a well-fixed acetabular component and stable femoral component (Figure 2). Figure 2: Imaging at 6-month follow-up demonstrating acetabular component with osseointegration and unchanged femoral component with stable osteolysis in the greater and lesser trochanter. A thorough preoperative infection workup including ESR, CRP, and joint aspiration should be completed. Obtain multiple cultures intraoperatively and ensure that these are followed through for 7 to 14 days. Give thoughtful consideration to blood management including preoperative type and screen, use of tranexamic acid [10, 11] if appropriate, and possible use of a cell saver . Depending on the extent of revision, determine if the cell saver is beneficial, keeping in mind that in cases of severe metallosis or infection, a cell saver is not appropriate. . Perform a thorough debridement of osteonecrotic soft tissue, which may otherwise serve as a nidus for infection. Avoid minimally invasive surgery; extensive exposure is required including sufficient removal of soft tissue around the acetabulum and femur to allow testing of both components’ fixation to bone. Laura Matsen Ko, MD, is an orthopaedic surgeon with Orthopedic Physician Associates, Seattle, Washington. Julie Shaner, MD, is an orthopaedic surgery resident at Thomas Jefferson University Sidney Kimmel Medical College, Philadelphia, Pennsylvania. Javad Parvizi, MD, FRCS, is from The Rothman Institute at Thomas Jefferson University, Philadelphia, Pennsylvania. Carney, B.T. and S.L. Weinstein, Natural history of untreated chronic slipped capital femoral epiphysis. Clin Orthop Relat Res, 1996(322): p. 43-7. Wensaas, A., S. Svenningsen, and T. Terjesen, Long-term outcome of slipped capital femoral epiphysis: a 38-year follow-up of 66 patients. J Child Orthop, 2011. 5(2): p. 75-82. Larson, A.N., et al., Avascular necrosis most common indication for hip arthroplasty in patients with slipped capital femoral epiphysis. J Pediatr Orthop, 2010. 30(8): p. 767-73. Nelms, N.J., et al., Total hip arthroplasty in the young: special emphasis on post-SCFE patients. J Pediatr Orthop, 2013. 33 Suppl 1: p. S137-42. 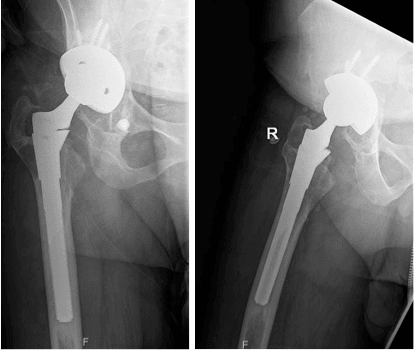 Lehmann, T.G., et al., Total hip arthroplasty in young adults, with focus on Perthes’ disease and slipped capital femoral epiphysis: follow-up of 540 subjects reported to the Norwegian Arthroplasty Register during 1987-2007. Acta Orthop, 2012. 83(2): p. 159-64. Philpott, A., et al., Predictive outcomes of revision total hip replacement–a consecutive series of 1176 patients with a minimum 10-year follow-up. Maturitas, 2014. 77(2): p. 185-90. Torchia, M.E., R.A. Klassen, and A.J. Bianco, Total hip arthroplasty with cement in patients less than twenty years old. Long-term results. J Bone Joint Surg Am, 1996. 78(7): p. 995-1003. Engesaeter, L.B., et al., Low revision rate after total hip arthroplasty in patients with pediatric hip diseases. Acta Orthop, 2012. 83(5): p. 436-41.Adelani, M.A., et al., What is the prognosis of revision total hip arthroplasty in patients 55 years and younger? Clin Orthop Relat Res, 2014. 472(5): p. 1518-25. McConnell, J.S., et al., Reduction of blood loss in primary hip arthroplasty with tranexamic acid or fibrin spray. Acta Orthop, 2011. 82(6): p. 660-3. Aguilera, X., et al., Efficacy and safety of fibrin glue and tranexamic acid to prevent postoperative blood loss in total knee arthroplasty: a randomized controlled clinical trial. J Bone Joint Surg Am, 2013. 95(22): p. 2001-7. Garvin, K.L., et al., Blood salvage and allogenic transfusion needs in revision hip arthroplasty. Clin Orthop Relat Res, 2005. 441: p. 205-9. Simonian, P.T. and R.P. Robinson, Titanium contamination of recycled Cell Saver blood in revision hip arthroplasty. J Arthroplasty, 1995. 10(1): p. 83-6. Next articleWhat Do I Do if I Cut the MCL?